In a stunning reversal two days ago, President Obama announced he would postpone plans for a military strike against Syria due to its use of chemical weapons in order to seek approval of the US Congress, surprising many because of its abrupt change from the President's prior resolve to initiate such action on his own. In a further reversal today, President Obama announced he has again changed his mind and will decide whether to send bombers to Syria by means of a coin toss. 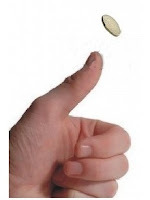 In his statement this morning the President made it very clear in no uncertain terms that the coin to be tossed will be a quarter. "Let me be totally specific and unequivocal about this," said the President, speaking to the American people on national television, "that by engaging in these illegal and deplorable crimes against humanity Syria has irrevocably crossed the red line that I long ago firmly and immutably established and our resolve to act decisively against the foul and malevolent deeds of the Assad regime is steadfast, unwavering, and unshakable, provided the coin flip comes out our way. If necessary, we may have to make it two out of three." The President further indicated that it is still his intention to confer with Congress before taking action on the coin toss. "I will ask Congress when it returns on September 9 to vote on whether it shall be heads or tales that signifies "Go or No Go!" added the President, "or whether Vice-President Biden should call it in the air." Administration sources revealed that several possible alternatives to the coin toss had previously been considered and discarded including use of a Ouija Board, construction of a giant spinning wheel similar to the one made famous on the television program Wheel of Fortune (created by Merv Griffin), and/or Vice-President Biden blowin' on and rollin' a pair o' dice! Despite significant promise, the last option had to be shelved when Mr. Biden could not stop himself from singing "Luck Be A Lady Tonight" from Guys and Dolls and admitted to having gone ahead and purchased several dark green Damon Runyonesque three-piece suits with taxpayer money. Even a Republican knows proper way to make a decision of this magnitude is Rock/Paper/Scissors. Obama will go down in history as just another two-term president. At least Biden got some new clothes out of the deal. I love that idea! LOL, Scissors,Paper,Stone! Wish I'd thought to include it as one of the rejected options in this bit. And you're right about Obama; he's no four termer like Roosevelt!